The first Icelandic geothermal power plant to be built on foreign ground has launched operations in the geothermal area of Berlin in El Salvador, as announced by Icelandic geothermal energy company Enex on Saturday. Underwear maker Fruit of the Loom is the largest employer in El Salvador according to the US embassy. So it is not good news when the company announced today that it would temporarily layoff some 3000 of its 12,000 employees. The layoff was blamed on declining orders from the company's customers due to overall economic conditions. Despite the layoffs, the company reiterated its commitment to its factory operations in El Salvador. Fruit of the Loom is based in Kentucky, and is a subsidiary of Warren Buffet's Berkshire Hathaway. A 2005 story from a Kentucky newspaper describes the company's El Salvador operations and the role of the maquiiadora sector in El Salvador's economy. According to La Prensa Grafica, the overall textile sector in the country employed 104,000 workers in its maquila factories at the end of 2008, down 6,000 from the prior year. Today is the 29th Anniversary of the assassination of Salvadoran archbishop Oscar Romero. To commemorate the day, I am republishing one of the most popular posts on this blog, a listing of the top 10 quotes of Romero, compiled by the San Romero Discussion Group. Law enforcement authorities in El Salvador made arrests this weekend in the case of Katya Miranda. A year ago I described how Salvadoran bloggers and others had begun a campaign demanding justice in the 9 year old case which symbolized the problems of impunity in the country. The facts of the case are heinous: Katya's mother left her two daughters at the home of her paternal grandfather along El Salvador's coast with a promise to pick them up in the morning. Yet when morning came, nine-year-old Katya was dead -- raped, beaten and murdered. Despite the presence of members of her father's family and their employees at the home, nobody claimed to have seen or heard anything. The father, grandfather and other male relatives are high-ranking officials in El Salvador's military and the National Civilian Police. La Montañona, a forested mountain in northern El Salvador that reaches 1,800 metres above sea level, was a stronghold of the FMLN guerrillas during the country’s armed conflict. Today, its forests and stories of bombings and rebel hideouts have begun to draw ecotourism. As you might imagine, a lot has been written in the past two weeks about El Salvador in the press around the world. Usually when there is something written in the English language press about El Salvador, I can bring it to your attention but there is way too much right now. Instead, I'd like to point you to some essays which merit reading because they go a little bit deeper than the standard story-line of the television journalist turned candidate for the former Marxist guerrillas who campaigns against the conservative governing party which relied on fear as a campaign theme. A pair of articles, one before the election and one after, written by Roger Atwood for Mother Jones, benefit from the fact that he lives in El Salvador. His understanding as a resident of the country are apparent in El Salvador's Left Turn and El Salvador's Quiet Revolution. Esta vez me atrevo a decir con propiedad, el internet ha sido muy importante esta vez en las elecciones, debido a que el público joven, lo ha utilizado en vez de los medios tradicionales, y quiero felicitar a los partidos políticos por habernos tomado en cuenta en muchas ocasiones. No hay que olvidar que El Salvador esta vez tiene que estar más unido, dejar las diferencias, aferrarse a Dios para poder tener un mejor país, ya que todos unidos lo podremos lograr, y así poder lograr el verdadero CAMBIO, no solo cambio de gobierno, sino cambio de actitud. We're going to change the way we make policy. And one of the most significant changes is that we will no longer have a government at the service of a privileged few. And we will no longer have a government that creates an economy of privileges for the privileged. Now, we need a government like the one envisioned by Mons. Oscar Arnulfo Romero, who in his prophetic message said that the church should have a preferential option for the poor. A federal appellate court in the US today upheld the civil judgment against Nicolas Carranza. In 2005, a jury in Memphis found that Carranza failed to stop crimes against humanity when he was a top commander of El Salvador's security forces. He was held responsible in civil claims by four Salvadoran victims who said they were tortured or that their family members were killed by soldiers under Carranza's command. The appeals court's opinion rejects arguments Carranza made based on the statute of limitations, the Salvadoran amnesty law, and various evidentiary rulings. The decision continues the impressive string of favorable court rulings achieved by the San Francisco-based Center for Justice and Accountability which is also involved in bringing the case of the Jesuits into the courts in Spain. The election campaign was heavily marked by attacks and aggressive accusations between the two parties. The debate also was focused on the doubts whether the possible FMLN victory would trigger a change in the bilateral relations with the US. However, Charge Blau congratulated the people and the government of El Salvador for building a democracy where calm elections were celebrated: “Mauricio Funes has won in a fair and free election. We have said many times that our intention is to continue with the good relations with El Salvador from government to government, and from people to people”, said Mr. Blau. 8:30 pm -- still waiting for the TSE to release more official results. ARENA was just on TV asserting that their data is favorable. 6:45 pm Channel 21 Megavision has a preliminary count showing the FMLN winning 57% to 43%. TCS shows the FMLN with 53%. It's not looking good for ARENA. 6:30 p.m. -- Preliminary results from the government won't be released for another hour. Looking at the Channel 21 and some results they are displaying on the screen, it looks like the FMLN and Funes have the advantage in the early counting. Lots of articles are being written with predictions of what is key and important in this Sunday's election. (They can't all be right). The Christian Science Monitor writes that evangelicals are key to El Salvador elections. The articles describes a movement of the evangelical Christian population of El Salvador towards the left, compared with a strong preference for ARENA in 2004. Thank you for your concern regarding the elections in El Salvador. The Government of the United States reiterates its official position that it does not support either candidate in the upcoming presidential election in El Salvador on March 15. The Embassy of the United States in El Salvador has stated this position publicly and repeatedly since November of 2007. The separation of powers and freedoms in the United States allows the debate in which members of the U.S. Legislature have expressed their opinions, which do not reflect the official position of the United States. As Members of Congress, we reject the threats of 2004 and any effort to instigate another US intervention in Salvadoran politics. We feel that U.S. immigration policy should not be made into a political instrument used to influence foreign elections. Similarly, we reject the suggestion that the US government would seek to financially punish Salvadorans, in this country or in El Salvador, for exercising their right to elect a government of their choosing. As members of Congress, we will not support any such measure. Today is the last day El Salvador's political parties are permitted to campaign prior to the presidential election on Sunday. As the SHARE Foundation prepares to guide International Observers, mostly from all over the United States, the propaganda has taken over the streets of San Salvador. Just from my first few days back in the country since 2007, there have been more electricity poles splashed with FMLN red and white masking the blue of ARENA. This technique actually making it pink and white, which is just more symbolism of the desperate campaigning techniques of both sides. There are no laws or boundaries of respect for campaign materials. ARENA clearly has more money for campaigning in San Salvador taking more space than the FMLN on the radio. One aspect of the campaigns of El Salvador's presidential candidates is their interaction with the country's churches, particularly the evangelical churches which are the fastest growing segment of churches in the country. Rodrigo Avila meeting with evangelicals in Santa Ana. Funes meets with 600 evangelical pastors. Three organizations with an interest in El Salvador have teamed up to publish the report, The 2009 El Salvador Elections: Between Crisis and Change. Topics in the report range from the campaigns and the economy, to militarization and the diplomatic front, and much more. These sections are, in turn, divided into more specific issues, such as free trade, water privatization, Plan Mexico, regional integration, and potential relations with the new Obama administration. This timely report seeks to reflect on El Salvador’s current situation as well as the possibilities and challenges ahead at this pivotal moment for the nation’s future. The Committee in Solidarity with the People of El Salvador (CISPES), the North American Congress on Latin America (NACLA), and Upside Down World collectively edited the report. 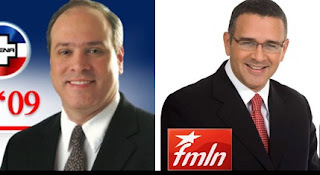 As one would expect, the report is supportive of Mauricio Funes and the FMLN and reflects the left-leaning views of the sponsoring organizations. As many of you know, I fractured my knee while in El Salvador as an observer for the January elections. The knee is healing fine, but my biggest disappointment is that I will not be able to travel to El Salvador for the presidential election. So I am looking for contributors who are, or will be, in El Salvador for the presidential elections two weeks from today. As I try to make available comprehensive coverage of the presidential election, write up your observations of election day and the days leading up to March 15 and send them to me using the link in the right hand column. I can't promise I'll post everything I receive and I reserve the right to edit, but I look forward to anything you care to send. Thanks.